Town boss Nathan Jones was once again left frustrated that his side failed to finish the month off on a winning note as they were held to a 2-2 draw on Saturday. So far this term, in Luton’s final seven league matches of the month, they have only won twice, against Newport (September) and Crewe (November). It’s just this game, the end of the month game, where we really get to cement our place at the top and we don’t and we make it hard for ourselves. They have drawn against Mansfield (August) and the Robins, with defeats to Coventry (October), Port Vale (December) and Wycombe (January), three of their six losses so far this term. Jones said: “It’s another missed opportunity for me and I don’t mean to be disrespectful in any way, but we’re home, we’re top of the league, we’re in great form, we haven’t played anywhere near what we can do and it still should have been enough. “But it wasn’t. It’s just this game, the end of the month game, where we really get to cement our place at the top and we don’t and we make it hard for ourselves. “We’ve had to come from two behind, it’s a reasonably fair result in the end if you look at what they did for the away side. “They looked reasonably dangerous on the counter attack, but we should have had enough and won this game. “It’s so disappointing, it really is, it’s sickening at times as I’ve said before. I don’t want to go through what we did last year. 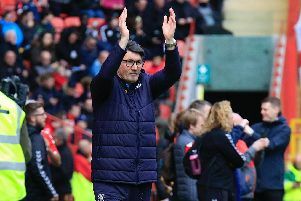 It also stretched another frustrating personal statistic for Jones too as he has now not tasted victory against Cheltenham since taking over as Luton boss, with three draws and a defeat from his four attempts. He continued: “Coming into the game, we knew it would be a difficult game. “I’ve never beaten these, they’ve come and somehow done a job on us. “Last year we had 80 per cent possession against them, we had about 19 chances, they had three and beat us 3-2, so they’ve got something on us. “Tactically they do a job on us, somehow, but I’m just disappointed, I really am and that’s the main overriding emotion I’ve got. “We weren’t really at it, we knew we had to be patient because they come and they sit in, they change, they play totally different against us than against any other side in the league. “So we knew we’d have to do that, we’ve worked on that this week and being patient, but every time we got into the final third, we either gave it away, or we didn’t pick the right pass, or we didn’t have enough quality. “Then we had opportunities, Olly Lee had loads of opportunities from outside the box that normally, test the keeper, or he’s a wonderful technician, but we didn’t have that. “We had balls flashed across, Cornick had an opportunity, we needed to get the first goal. Jones was also annoyed by the manner in which Town conceded their first goal, Joe Morrell beating keeper Marek Stech from fully 30 yards. He added: “It obviously deceived him but I expect my goalkeeper to save that from that distance.